Our Cavachon Puppies for Sale Will Captivate You with Their Charm! Looking for Cavachon puppies for sale? Well, you’ve certainly picked a very sweet and loving breed! 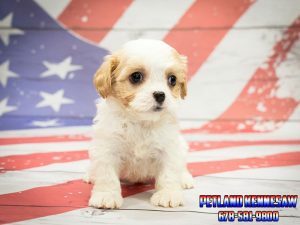 If you’re looking for a designer breed that is small in size and can live comfortably in apartments, then you’ll find our Cavachon puppies for sale a good bet. We have Cavachon puppies from the best breeders in the country. You will get puppies that will fit well within your environment and at the same time offer you unrivaled companionship. The Cavachon is not a pure breed dog, it’s actually a cross breed between the Cavalier king and bichon Frise dogs. This combination gives rise to a cool tempered, fuzzy coat and lovely breed that likes human company. They are small dogs making them a perfect choice for people who have small spaces especially those living in the apartments. They’re also an ideal dog for those who travel extensively, carrying this dog along in your adventures will not be a hassle, it’s actually easy. Also the fact that they don’t shed frequently means that your carpet as well as car seats will not be soiled. Cavachons have a soft and silky coats which also have some slight waves. The standard colours for these coats include white, a combination of white and apricot, on one side we those which have white colored coats combined with some black areas and on the other there are those which have black coats with tan markings. The different types of coats means that the dog owner has a variety to choose from. Those looking for aggressive canine friends will be disappointed to find the Cavachons have a cool character. The canine friend is gentle, tolerant in most cases and quick to make friends. This makes them a good choice for dog owners who have children or other pets. It won’t never disturb the peace, it knows how to respect other pets’ space. Children will be happy that they have a companion who does not compete for attention from their parents. This kind of character perhaps contributes greatly to making this dog a favourite in many homes. Cavachons are full of energy but not like some dogs which are hyperactive. The dog is composed; it doesn’t use its energy negatively. To give it the best and help consume this energy it needs moderate exercise, for example a walk in the park would be ideal, it helps in staying fit as well as stimulating the dog. Get a dog that will fit well within your lifestyle, our Cavachon puppies for sale will help you towards this end. The Rare and Elusive Brindle Pug Puppies for Sale at Petland! You’re telling me that Petland has brindle Pug puppies for sale? Yes! Historians tell us that Brindle Pugs have been with us since 400 BC, and were first seen around China and some other South East Asia countries. All the brindle Pugs in Australia, Europe and America are accepted to be descendants of the original pets from China and the rest of Asia. This might come as no surprise, but the dog world never ceases to amaze! With our brindle Pug puppies for sale, you will discover more about these pets, something that you may never know until you take one at home! Want to check out all of our available Pugs, just click here! What is so unique about brindle Pugs? Brindle pugs comes in different colors, some are black and silver, fawn and dark brown and some rare colors, such as with the brindle Pugs. The striping pattern is what distinguishes the dogs from other breeds, and Pugs are just one of the many breeds that can be this unusual color. The stripes are gray and brownish and may also be seen on other dogs such as boxers and mastiffs but are not as rare as they are in the brindle Pugs. What can you expect from our brindle Pugs? With our brindle Pug puppies for sale, you can expect nothing but the best, and you will get well groomed pets! They are also in very good health, having been obtained from the best breeders in the country. You will be getting puppies that will not only make your house alive, but also provide the best company. The training they have received makes them easy to handle, they already know how to conduct themselves during feeding time, as they have been properly weaned and are eating on their own. 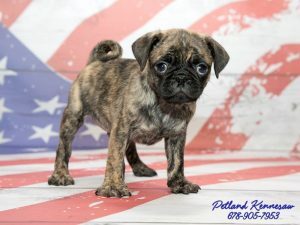 Take advantage of our brindle Pug puppies for sale to get puppies that will give you the love and companionship you need! Mini Hippo Puppies for Sale: Do You Know How Cute These Puppies Are?! 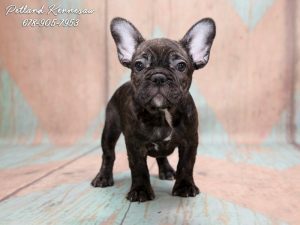 We have several mini hippo puppies for sale, dogs that will give you what you need and also bring the best out of you as a pet owner! You will be getting mini hippo puppies for sale that are well bred, trained and prepared to settle into their new environment. Here’s some information that will help you take good care of your lovely pet. Like its name suggest, this pet dog resembles a little hippo. It has a broad and square shape perfectly proportional to its height and length. It also has a padded muzzle, wrinkled head, shoulders and neck. Its tongue is described as blue-black. The dog comes in three types of coats, the horse coat which is less than a quarter inch in length and has a rough texture. The brush coat is less than one inch and has a velvety touch, the third type of coat is the beat coat which is normally longer than one inch and has a wavy smooth feel. The dog does not shed, so those people who don’t like pets soiling their cars and carpet will be at home with this pet as it won’t fill their cars or houses with coat shedding. A little shedding normally occurs for a few days during the spring and fall season. This means that one can prepare for it and take action to ensure that the dog does not mess the car or carpet. The dog is known for its cool temperament, it’s playful, calm, independent and always alert. This makes it a good companion in the house. It is easily trained given it cool and quiet nature, Some breeds may be a bit aloof and one needs to discover this early enough to ensure that they don’t become overly domineering especially when you have several dogs in the house. When well taken care of through proper feeding grooming and exercise, mini hippo puppies turn out to be perfect companion. Take advantage of our mini hippo puppies for sale and get a puppy that will be the companionship you deserve. KENNESAW, Ga., Aug. 18, 2017 /PRNewswire/ — Working to redefine the words, “puppies for sale” Petland Kennesaw hopes to change the canine game. With a desire to inform the public about reputable breeders, the family-owned pet store brings a bit more heart to buying a puppy. To help people understand the difference between a top-quality breeder and a puppy mill, they highlight the providers that are worth their salt. To that end, the pet store in Kennesaw has announced their partnership with Daynes Ridge Kennel. Owned by Jeremy Roger and his family for 15-years, Daynes Ridge Kennel has one focus; to safely raise the breeds they love – Bernese Mountain dogs, and English and French Bulldogs. With proper love, care, and time in a home-like setting, Daynes Ridge Kennel puts a huge focus on adult and puppy socialization. Happy, healthy dogs have the best puppies. The best puppies are the best new family members. Additionally, at Daynes Ridge Kennel, vet care is optimum. They work closely with their veterinarian to see that the appropriate puppy vaccination, preventive de-worming, and prophylactic treatments are given. For more information visit https://www.petlandsummerville.com/. Petland Kennesaw is based in Kennesaw, Georgia that is owned and operated by the Parker family. For 16-years, while providing top-quality pet care, the family has placed over 20,000 puppies in welcoming homes. Petland Kennesaw puppies receive top-notch veterinary care, five training classes to teach basic obedience, an introduction to a veterinarian, as well as year health warranties. Our Mini Goldendoodles for Sale Will Bring a Smile to Your Face! If you’re looking for a dog that requires little attention where you can go for hours or even the whole day and it will not feel lonely or bored, mini Goldendoodles fits the bill well. The dog requires infrequent grooming for it to maintain upkeep; you also need to give it occasional trimming or stripping. Once you have ensured that the dog is well fed and has a comfortable environment, it won’t ask for more. It will give you company and also play with you when needed. If you’re the kind of person who perhaps, due to a busy schedule spends the better part of the day out of the house and are in need of a dog that fits that kind of a schedule mini Goldendoodles are the best option. If you ask dog owners, one of the most annoying things about dogs is shedding hair in the car and house. Health experts will tell you that it’s a health hazard, others will tell you that it is untidy. Mini Goldendoodles will spare you all this trouble as they are known for minimal shedding of hair. With them you won’t have to keep on removing the hair on the car seat and on the carpet. The dogs are known for their obedience and ability to listen to commands. You will have a smooth ride when training them. They will follow the repeated instructions and you won’t have to repeat them over and over. Their level of intelligence allows them to grasp what the owner wants, making them some of the best breeds when it comes to dog training. Their energetic, affectionate and playful nature makes them the best companions for the kids. Having one in the house assures you that kids will not engage in truancy as they’ll have a companion who not only keeps them busy but also makes them happy. Having a mini Goldendoodle in the house is the best thing you can do, heed the mini Goldendoodles for sale and own a dog that you will never regret. You Can Get Close to Royalty with Our Corgi Puppies for Sale! Our Corgi puppies for sale aren’t just for Queens, you can have one too! Corgis may be known for being the main target when it comes to internet memes due to their short stubby legs, tilted head and a hotdog body, but do you know they have been the favorites of the British royal family? Queen Elizabeth II has owned more than thirty during her reign. There goes another meme, are Corgi’s royal or should we say they are loved by the royals! So if you see the corgi puppies for sale sign again, don’t hesitate, you are just developing royal tastes, in our opinion. Start with one and, if possible, eventually own more than thirty to break the Queen’s record! 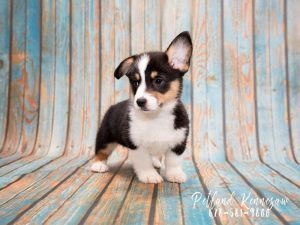 Want to all of our adorable Corgi puppies for sale, just click here! If you have never seen Corgi puppies playing, then you have missed one of the most dramatic sights. With their wiggly bodies and short, stout legs, their jumping and wiggling looks like the launch of a great charge. They are full of energy, more playful than kittens, and it’s a scene that you will just be forced to stop and watch no matter how busy you were. Therefore, if you see our Corgi puppies for sale message and end up taking one home, you’ll never experience a dull moment! When you take proper care of the puppies, you’ll have found an entertainment hound; they will lighten your days making them joyful. The internet memes will no longer be funny; you will have with you the source of laughter, joy and happiness. For Corgis, you only have two breeds to choose from. Experts say that Corgis evolved into two separate breeds, which are the Pembroke Welsh Corgi and the Cardigan Corgi. It was not until the 1930s that the two were recognized as two separate breeds, all along people had thought that they belonged to the same family, but the differences are now very clear. Although they are separate breeds with distinct characteristics, one thing remains the same, they are both highly intelligent herding dogs. They continue to attract attention both for their looks and they can be found in the corridors of power and Buckingham Palace, a place they can comfortably call home! Pomskies for Sale: Check Out Our Coolest New Designer Breed! Here at Petland, we have the cutest Pomskies for sale anywhere! Cute, lovely, friendly are just some of the adjectives that have been used to describe the Pomsky! You can rest assured that with our Pomskies for sale, you will get a new pet that not only fits these descriptions but also gives you companionship that is full of playful activity and laughter! This perhaps explains why they have become recent additions to the designer dog list. As new breed of designer dogs, they have been gaining popularity not just in Europe and the United States but also in Australia. They are still considered a rare breed and you would be lucky to find one, so when you see Pomskies for sale, you might want to scoop yours up! Want to see all of our adorable Pomskies for sale? Just click here for our available puppies page! Of course, you can always stop by our store to get all the Pomsky cuddles you could ask for! The Pomsky is a cross breed between the Pomeranian and Siberian husky. Just like most hybrid breeds, its physical appearance is not very predictable. You may have known Pomskies to have certain features but it should not surprise to see a dog which is different from what you expected. Variations should be expected. 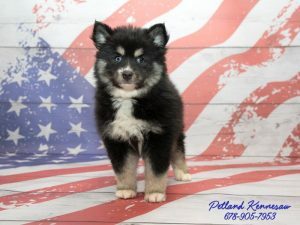 You may have seen a breed that leans more towards the husky but at times another puppy may be more like a Pomeranian, all from the same litter. But don’t worry, this is what makes the Pomsky so unique! They say the kind of temperament portrayed by the parent dog, greatly influences the puppies’ character, this is truer in Pomskies than any other breed. Having said that, it’s important to understand that Pomskies are a generally highly intelligent, playful and lovely dogs. Perhaps apart from their appearance, their temperament makes them one of the most treasured dog breeds, acquiring some of the most positive adjectives used to describe a dog. Their high level of intelligence and response makes it easy to train them; however the pet may have inherited the Pomeranian’s stubborn character. This will require the pet owner to handle them calmly and firmly or risk acquiring the “small dog syndrome” or other behavioral issues. They require a high level of activeness with frequent exercise so they don’t become bored or anxious. Feel free to engage with us about this breed, we are the experts when it comes to the Pomsky! Give our dedicated Pet Counselors a call today with any questions on the Pomksky or any other dog breed. Get a Lifelong Workout Companion with a Miniature Australian Shepherd for Sale! 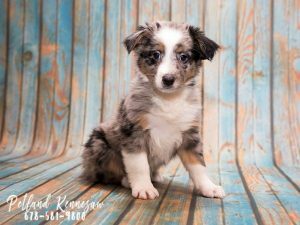 For people looking for a Miniature Australian Shepherd for sale, learning a little bit about the dog will help you figure out if it’s the puppy for you! This will make it easy to care for your new pupper! Having the right knowledge will also help you adjust the environment accordingly in order to make the family, as well as your new canine friend, comfortable. Want to see a picture of the Miniature Australian Shepherd for sale in our store right now? Just click here for our available puppies page! The dog, just like its name suggests, has a smaller stature than the standard. It has a medium length coat with a red merle, blue, chocolaty red color. All colors will have all white or tan markings. It has a straight coat although some species are slightly wavy with feathering around the legs, mane and neck. The hair on the head, the front part of the forelegs and in the outside of the ears is shorter than in the other parts of the coat. It comes with a top part of the head being flat and clean cut, feet which are oval and compact. Miniature Australian Shepherds are liked for their easygoing, playful and affectionate character. The puppies easily bond with the other pets and the adults are great companions especially with active children. 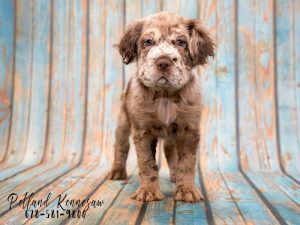 They are described as courageous, affectionate and loyal making them a perfect choice for those who are looking for a miniature Australian Shepherd for sale to keep as a family pet. Their liveliness, agility, high intelligence and attentive nature make them easy to train. Most people who have had them as pets have described them as dogs which easily take instructions especially easy. The dogs need company and should not be left alone for longer periods. Not being stimulated can make them anxious and they can turn destructive. If you are to leave it alone for some time, it’s advisable to keep it engaged with enough physical and mental exercises to ensure that it doesn’t get bored easily. Some people say that they always looking for something to do, their level of intelligence and activeness are part of the breed. You also need to socialize it early so that it becomes accustomed to strangers. Some may be seen nipping people’s heel as they attempt to herd them! Understanding the Miniature Australian Shepherd before you get one will make you a better owner in the long run! For more information visit our website and learn more about this active and lovable little breed! A Cockapoo Puppy for Sale is as Loving as it is Fluffy (And that’s a Lot)! We’re certain a Cockapoo puppy for sale is just the new companion you need! With several cockapoo puppies for sale, we think you’ll find one to fall in love with! Cockapoo puppies not only provide the best company but also are easy to care for and groom. But before taking one home it’s important to consider how much time you will be spending with it. Like any other pet, it requires attention and training especially when young. This means that to get the best out of it, you will need to spend some quality time with it or rather ensure that there will be somebody at home to ensure that the puppy is well taken care of. 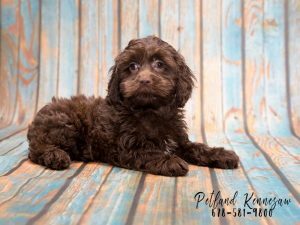 Want to see pictures of a Cockapoo puppy for sale in our store, just click here! Once you take your Cockapoo puppy home make it as comfortable as possible, ensure that there will be somebody to train it especially on toilet matters. Once it soils the carpet, it might be difficult to train it out of such a behavior. This stresses the need for closer attention especially during the first days of their stay in a new environment. Cockapoo puppies are precious, but any puppy is frustrating when not housetrained. They can make a mess around the house but if you take proper care, they are the most cooperative and well-behaved pets around. This stresses the need for preparedness; you shouldn’t take a pet home unless you’re prepared physically and also emotionally. Physical preparation involves making the environment conducive for the dog, knowing its character and temperament. It involves making preparations in such a way that the pet will feel comfortable. Emotional preparation involves getting your mind set for the reception of a new pet. This also involves helping others to adapt to the new pet, welcoming it to its new environment and doing everything possible to ensure that it’s comfortable. 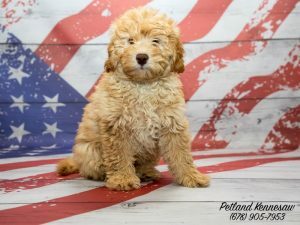 With our Cockapoo puppies for sale we are not just about buying the pet, we also ensure that the new owner gets information that will make it easy to live with the new friend. We have loads of information on our website that will help you take care of your pet and also enjoy the best from your new friend. Petland’s Guide to Buying a Dog for You and Your Family! Deciding all the particulars in buying a dog for your family can be tricky! When buying a dog there are some important factors that need to consider. This will ensure that you get the kind of dog that will suit your lifestyle and also enjoy the environment. In this blog are some of important things that you need to think about before bringing the pet home. Don’t want to wait to see pictures of all the adorable puppies we have in the store waiting for you? We understand! Just click here for our available puppies page! Many people say that they love dogs, but when you tell them to bring one home they tell you they are not ready. I normally respect their response as it’s not good to bring a dog home when you are not ready. You need to prepare yourself both in terms of where you will keep it, what it will eat as well as emotionally feel that you are ready to have it in the house. It’s also important to ensure that other members of the family, especially children are willing to have the dog around. There will be competition for attention and the children would not be happy if they are ignored or their place taken. The same goes for the other pets in the house, they would also like to continue getting similar attention even with their canine friends around. Animals also experience conflict; this situation can be avoided by ensuring that they are well prepared to receive a new friend. As the owner, you have a role to ensure that you train the children as well as the other pets to receive the dog. If you feel that the environment is not conducive, take your time, and continue preparing until such a time when you and those around you are ready for an additional member. Do you know the right breed? When buying a dog, you need to get the right breed, one that will fit your environment and lifestyle too. There are those that like to be indoors only, while other are better suited for an outdoor environment. You’ll need to ascertain which breed will be comfortable in your home. If you have enough space and can allow the pet to roam outside without fear of roaming away from the yard, there are some breeds that fit that description. All that you have to do is analyze your environment and get a breed that fits in well. Experts and breeders can help you towards this end. Don’t make the mistake of selecting a breed blindly, you’ll only get frustrated! In our website, you’ll find all the information needed to allow you make this decision, we are happy to help you buy a dog that fits in your lifestyle and environment!